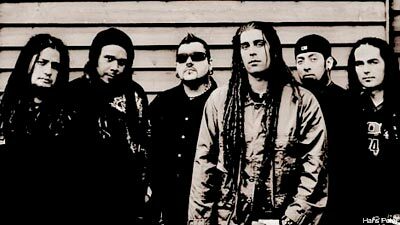 Ill Nino Celebrate New Jersey Pride Across the U.S.
Ill Niño may have started out in the great state of New Jersey back in the late 1990s, but the band members are currently spread across the country. Despite the distance, the band makes things work. "I live in Texas," drummer Dave Chavarri told Noisecreep. "[Bassist] Laz [Pina] and [vocalist] Cristian [Machado] are in New Jersey still. [Guitarist] Ahrue [Luster] is in Denver, and [guitarist] Diego [Verduzco] lives in Los Angeles and [percussionist] Danny [Cuoto] is in New Jersey. Three of us fly in, and we rehearse for a week before a tour. "We did our last record in L.A. and spent two months there, but this time, we all feel like we want to bring it home. We want it in Jersey, based at home. I lived there 20 years, and it adds a vibe and angst to your writing." Ah, that patented East Coast angst. It's the stuff of legends. "Everyone has big balls," Chavarri laughed about the East Coast attitude. "People will tell you they don't like to your face and won't candy coat it. There are so many people in the area. There is no room to do s---. People are fist fighting for parking spots. I love New Jersey and New York; I adore it. I miss it every day. I don't live there anymore, only because the cold is brutal in the winter, and I was there my whole life and I needed a change of pace. "My entire family is in Texas, so I moved there. Other than that, I miss it every day. It is my stomping ground, and it is not for the soft-hearted. People will tell you to 'f--- yourself' real quick. You will tell people to 'f-- off' and get a couple 'f--- yous' back just on the way home from work."